Since moving to Minneapolis I’ve had a hard time finding quality produce at a reasonable price. My first forays were a disaster and I whined about it at length. Katy had suggested over, and over, that Costco was probably going to be my best option. I was hard pressed, as it’s just John and I and that’s some serious bulk that I’d have to use up in a short amount of time. I really missed my A&G grocery store! So much so that I googled my dilemma only to find out I wasn’t the first Chicago transplant that bemoaned the shortage of great produce in Minneapolis. Turns out, Chicago is a huge hub for transportation of many products, among them produce, which enables that city to sell a huge variety of beautiful and bountiful produce at such a great price to consumers. I finally realized I was not going to win in my search and headed off to Costco, pouting. Among other things, I bought a huge bag of broccoli, ate a lot of broccoli, got tired of broccoli, and then proceeded to buy more broccoli. What I was thinking, I’m not sure, but it must have been because I was about to encounter this marvelous soup from Molly Wizenberg’s blog Orangette. It’s such a stunning recipe, that I now buy two bags of broccoli when I’m at Costco and whip up a double batch of this every time! Bring to a boil, reduce to a simmer, and cook, partially covered, until the broccoli is very tender, about 20 minutes. Use an immersion blender to blend soup into a fine purée. 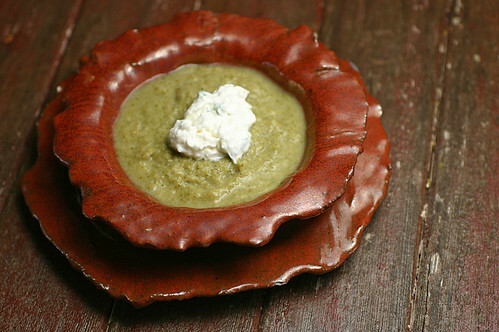 Stir in 1/3 Cup of Sour Cream Topping – recipe below – return to low heat until ready to serve. Add another dollop go the Sour Cream Topping when placing in serving bowls. Taste, and adjust as necessary. Love this soup! Got to sample a batch that your brother made and am making my own batch today. Thanks for posting the recipe.